My mom introduced yoga to me almost 10 years ago, in my Undergraduate years. I loved the physical challenge it presented but what appealed to me most was its teaching of body and mind awareness. My parents divorced when I was 11, and growing up in a very divisive home made me hyper aware of my emotions. Yoga allowed me to harness my self-awareness into a productive and healthy skill. How does my body feel, and how will I honor it today? Where is my mind going and how will I bring it back from wandering? Then, let it all go. For me, yoga is being kind to myself. Through my years of practice, I found my strength. I realized for the first time in my life what my body and mind was capable of. I found my breath, my confidence, my peace. I found myself. When I came to Shunyata about 4 years ago, when my husband and I moved to Milton, I instantly knew it was different from other studios because the teachers AND students were all so welcoming. Shunyata gave me a community in Milton. It has also always aligned with my personal philosophy of what yoga is. It is, by far, the best studio I’ve ever been to. I will forever be grateful to Shunyata for giving me such a wonderful space to practice. Because of the profound impact yoga has had on my life, I began to share it in my work (as a Behaviour Therapist for individuals with Intellectual and Developmental Disabilities). My clients love yoga because it’s fun and also teaches controlled breathing in difficult times. 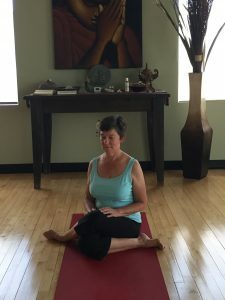 Shunyata welcomed one of my clients for private yoga sessions with Brian, which allowed my client to not only generalize her yoga skills in a new environment, but also prepare her for future yoga classes in other environments with other people! Lastly, I believe yoga prepared me for the scary and unpredictable nature of pregnancy and giving birth. 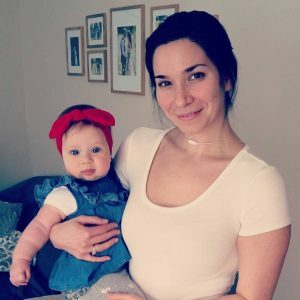 When I became pregnant with my daughter Madelyn, I had to give hot yoga a rest and put my awareness to the test and slow down my practice. I’ll always remember that I felt Madelyn kick for the first time in my morning yoga class. Pure joy. 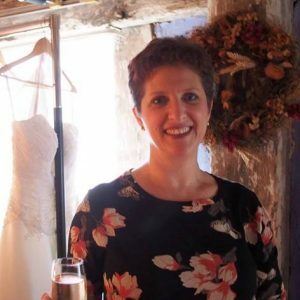 After giving birth, I had to allow my body to heal (from c-section) before I could get back to my practice. It was the hardest time in my life, for many reasons. Now, 8 months later, I feel stronger than ever, and so much gratitude for my body. Because yoga has been such a significant part of my life for so long, eventually I hope to complete yoga teacher training in the future. I have been coming to Shunyata for about 2 years now. Sometimes I come more often and sometimes less. The more I come, the better I feel. The best month for me was January, when I finished 30 yoga sessions in 30 days. That is something that I never thought I would be able to do. The most valuable lesson that I am learning here is how to let go. Letting go of physical tension leaves me with more relaxed muscles and fewer aches and pains. 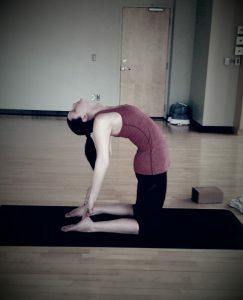 Letting go of ego lets me try new poses and not be overcome with embarrassment when I fall on my face. Letting go of anxiety allows me to respond to situations or conflicts, instead of reacting to them. I spend a lot less time feeling panicked. People always told me that I appear calm on the outside, but that is not how I felt inside. Now I feel more peace of mind, my inner calm matches my outer calm. Some results were more surprising to me, like how letting go of control made me feel much more in control of my life. I could get so much more done, with better outcomes, when I stopped trying to control every tiny detail. I am no longer paralyzed by indecision or perfectionist thinking. But the very best thing I’m letting go of is the hypercritical voice inside my head. The one that tries to tell me I’m lazy, boring, not good enough. There were some classes I showed up to when I thought “What am I doing here? I can’t do this. Everyone else here is stronger, more flexible, better than me.” Somehow I kept coming back, and eventually realized that I deserve a place in those classes too. I’m starting to trust my instincts and feel more confident. What a wonderful feeling of freedom. I have been practicing yoga for a couple of years. I used to live in Toronto where there are many studios. I started doing Kula, Iyengar, and Ashtanga. But I fell in love with Ashtanga. There is something about this discipline that really encourages me to do more and more, challenging myself in every posture, holding poses, finding calmness in every asana, breathing with vinyasa, ujjayi victorious breath. I am retired now and living in Milton. I was thrilled when I found out Shunyata Studio was offering “Intro to Ashtanga”. I got a community membership and I come to do my yoga practice almost every day. The studio is the best studio in Milton. The staff is very friendly and helpful. Brian, the owner, is a very dedicated man and I enjoy practicing with him. I cannot imagine a life without yoga. If I miss a class I feel guilty. Shunyata Yoga is the only studio offering a variety of classes such as Sivananda, Purna inspired practice, Ying Yang fusion, Power Yoga, Yin and Hatha. I would like to thank Shunyata Yoga for the opportunity to share my story with you. Practicing yoga makes me feel my life is complete….OM. Most of my life I have been extremely active. As a child and teenager , I danced and swam, instructed fitness classes as a young adult, and as a young mother revisited both the pool and eventually, the dance studio. But during that time, there was a lengthy period when serious back problems seemed to overtake my life. I was in constant pain and discomfort. I had to teach my youngest how to climb out of his crib, as I could not lift him. I was afraid to do almost everything because I was afraid it might hurt. The physical pain had become so imbedded that I had convinced myself psychologically that everything would hurt. I felt as if I was watching my life pass me by. After almost 10 frustrating years, I finally heeded the advice of several wonderful friends and professionals. “Try it. If it makes the pain worse, stop. If it doesn’t worsen the pain, great… at least you are doing something you love, and maybe, it just might help.” I began to dance again. My life began to improve. I was smiling again and happy. A friend tried to bring me to Shunyata for a Hot Yoga class. She would regularly ask me what I was doing. I was very adept at turning her down. There was no way I was going to Hot Yoga. I knew that I would not like it and I knew that it would cause the old injuries to re-establish themselves. And then, one day, I was caught off-guard. I had no excuse and had to go. I went to my first class (knowing that it was, of course, my last class). I could not believe that by the time I moved into a tabletop, I was sweating. By the time the class was over, not only was I drenched, but I was hooked. My only regret was that I hadn’t started sooner. That was years ago. I come to practice every chance that I get. Over the years my need for physiotherapy has decreased. My energy is better. I am willing to take chances again and I am a much happier, more positive individual. I can’t imagine my life without (Shunyata) Yoga in it! 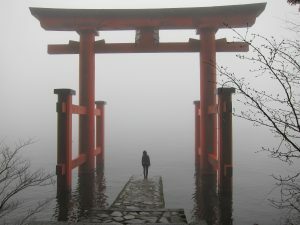 I’m one of the older faces at Shunyata, and I’m happy to share my experience. I’d love to encourage more people to join, as I believe yoga is one of the best all round activities for anyone. I started yoga when I was fifty -eight, thinking it would be a pleasant form of exercise. I really didn’t know anything about it. It sounded rather exotic, but I liked the sound of its gentle approach, honoring the body, working with the breath, and not straining or injuring myself. At the time, my only form of exercise was walking, so I thought I should be doing something else, but I didn’t like the idea of going to a gym and “working out” So when a small studio opened right beside my office, and the owner came by to introduce herself, and gave me a pass for a free class, I figured the universe was giving me a distinct nudge! I remember one of my earliest impressions was “Hey! A group activity for introverts!”. I took to it like a duck to water, and was soon pleased with the increased strength, balance and flexibility I was gaining. It wasn’t until five years later, when that studio closed, and I came to Shunyata, that a whole new dimension opened up for me. I arrived with a fully functional ego, which I had not learned to, “leave at the door” and I cringe now when I remember how I would come out of a class complaining about everything from the temperature of the room, to the music, even sometimes the instructor’s choice of poses that day! Thankfully my ideas were “acknowledged, given a place of existence, and gently ignored”. I kept attending, as my intuition told me there was something very important to be leaned here. I particularly loved the Saturday morning Yin class, where I finally learned to “find stillness”, and not be bothered in the slightest by any external distraction. Now, three years later, I can honestly say that I have found a sense of peace and calm that I never knew, that stays with me wherever I go, and I am so very grateful. Two years ago I had gone through a very difficult time in my life where I had developed a lot anxiety and depression. It was then that a co-worker of mine suggested that I come to the Shunyata studio to try out some yoga classes. I was told that yoga would be a perfect way to help me release all of the built up tension that was plaguing me both mentally and emotionally. Within the first couple of weeks I began to feel better. Surely but slowly my mental and emotional state had begun to stabilized. It had been a really long time since I have felt any sense of clarity. I always look forward to showing up on my mat knowing that it is my moment to let go of anything that is troubling me or holding me back. Thanks to the support of the instructors and my new fellow yogi’s I now see life in more positive and hopeful way. I started coming to Shunyata as a personal experiment and for weight loss. I was very skeptical about yoga in general and I never was able to really commit to anything. Shunyata provided so many things for me personally. I have never been in a place that radiated so much acceptance, positivity and peace. It truly has become my sanctuary, it makes me forget the outside world. My closest friends are people from the studio, and I honestly feel that I got to know myself and what I was capable of through my practice. The instructors are beyond amazing. So motivating, knowledgeable and so unique. I could not have picked a better studio. Shunyata grounds me and makes me look forward to my next class every single day. Shunyata is my happy place. When I started out at Shunyata, I was only willing to commit to one day a week. The stretch class. I lived in fear that all the pain I endured in my body would be made worse if I tried anything other than that. When I learned that years of debilitating anxiety and depression were the root cause of all my pain.. I decided to try one of the flow classes. I remembered being so afraid, as I laid on my mat, that I would fail miserably. Afraid people would see me for who I really was.. Depicting all this strength in life, and always having it together, but really feeling small and completely insignificant. I realized, in this first flow class, that not a single person paid any attention to what I was doing. Everyone was so focused in their own practice, and funny enough, I actually felt a little better about myself. I continued this way for months.. Coming up with reasons in my mind why anything more than my few classes a month were more than enough because of my constant physical pain. Until I met a really amazing woman. She pushed me to come everyday and give it a try. Reluctantly, I gave in. So this was it, yoga everyday. . How would I manage? How would I deal with the pain I would have to deal with after it all? To my surprise, it was simply the opposite. I noticed everyday, how much better I would feel.. A little more “bounce in my step”. . I was able to go into the room and completely tune out my thoughts. The thoughts that kept me so distant and sad. A whole hour to forget all that was going on in life outside those doors and just focus on me.. Or nothing at all. Mental rest. When I would leave class, all the thoughts would come flooding back.. But I found I was in a better, calmer and clearer state of mind to deal with the important thoughts and let go of the ones that were not serving me and making me physically ill. So here we are.. Two years at Shunyata. I am in a much better place, mentally & physically much stronger. I acknowledge the shift in my home. How my happier presence affects my children and my husband and all the people around me. I don’t need to pretend to be a strong person anymore.. Because I am strong. There is not enough thanks or words to say to Shunyata and all the amazing instructors there, who are nothing short of the kindest most caring people. Everyone has a story, this is mine. Yoga has changed my life and the way I look at it. And I like the way it looks now. In 2014, I was pregnant with my third baby when I learned I had serious pregnancy complications. I spent my days attending specialist appointments and suffocating under the weight of the situation. The realization that I may never meet my daughter was constantly on my mind. I had two small sons, who were two and three at the time and desperately needed their mom. My sleep was constantly fraught with images of losing my baby. In April, my daughter arrived perfect and healthy. Everyone breathed a huge sigh of relief, except for me; I was still suffocating with an overwhelming fear that something terrible was about to happen to her. Months passed, she thrived, everyone moved on, except for me. I put on a well-practiced smile and told everyone I was ‘fine’ but I knew I wasn’t. I was exhausted and constantly fearful. I had difficulty breathing, I felt like I had a snake coiling around my ribs slowly tightening its grip. I begged my chiropractor to examine my back; something had to be wrong, why couldn’t I breathe? I could hardly eat and my sleep was terrible. Despite being exhausted, my brain was overwhelmed with worries and I would lie in bed at night and struggle to catch my breath. My husband worked long hours, frequently travelled and I was very much alone. As months passed, I somehow kept up with my daily tasks. My kids were fed, wearing clean clothes and my house was tidy. Upon meeting people, they would ask ‘how I managed with three young kids?’ I would smile but secretly hoped that someone would stop and look into my eyes and see that I was not fine, not even close. I felt incredibly guilty that I could not give all of myself to my children. I felt dead inside. When my daughter turned a year and half, I was done. I could no longer hold on and felt like I was about to let go. The first month was a challenge, my body ached and I frequently had tears streaming down my face (hoping others would think I was just hot). As my body got stronger and my emotions bubbled to the surface something amazing happen: I began to heal. I could feel a shift within myself. I began to feel stronger and more resilient from the inside. My brain felt sharper and I felt a positive energy resonating within my body. I slept better at night and no longer felt constantly overwhelmed. My optimism and hope for the future had returned. And the ultimate benefit was that I could finally breathe deeply. I’ve always loved learning and challenging myself mentally as well as physically. So when I started practicing yoga in 2008 I instantly fell in love. Every class was a new challenge for the mind as well as the body. I craved the power as well as a sense of peace that yoga provided. 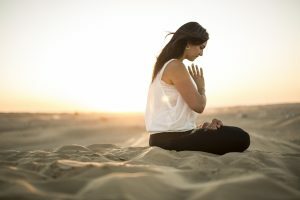 Eventually I was able to find a beautiful relationship between the body, the mind and the breath that I could not only use during my practice but also apply it to my everyday activities. A few years later, I ended up completing my 200-hour yoga teaching certification. This was just the beginning of my lifelong journey of learning and growing. I love attending various workshops and yoga conferences that inspire me through my practice as well as my teaching. All in all, I love yoga because it calms me, lets me appreciate the little things in life and allows me to eat more pie!